Let me begin by revealing the most difficult step of photo matching an item: Finding photos or video of the item in question! In the case of the Gamblers, nice photographs of game action are nearly impossible to find today. Game broadcasts that were taped and saved are also very elusive. There are several steps I like to take when researching the history of a jersey. The steps sometimes vary depending on the resources available. 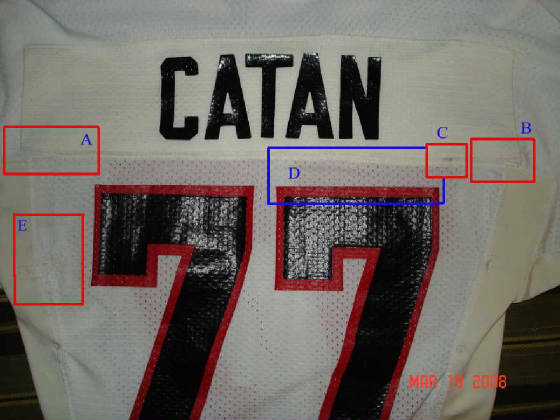 Often, jerseys without noticeable wear or modifications can't be truly authenticated as game used, just "team-issued" (after a thorough examination, the jersey appears to exactly similar to what the player would actually wear). In cases where photo matches are not available on older jerseys or equipment, there's still often a huge difference between professional and retail equipment -- thus making it much easier to differentiate the items that were at least team-issued. Over the past 20 years, the infamous "pro-cut" jerseys have made photo matching and/or provenance very important (thankfully this isn't much of an issue with Gamblers jerseys). Gamblers jerseys were made by Russell and usually have one tail tag per jersey (the exception is when a small "100%" NYLON" flag is present below the main tag). I have never seen a year tag or any other kind of strip tagging in a legitimate Gamblers jersey. With that being said, even though Gamblers jerseys appear simple to create, they are nearly impossible to duplicate today. Comparing a fake one to the real thing quickly exposes the impostor -- believe me on this. 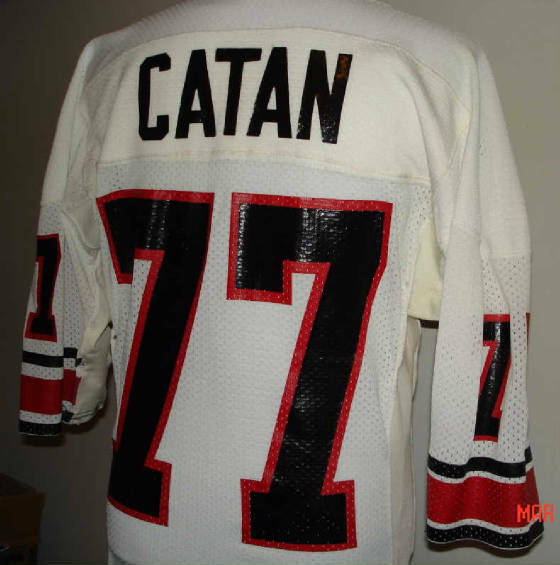 The example I'll show here was worn by Gamblers defensive end Pete Catan against the Denver Gold on June 9, 1985. The game was played in a rainstorm, and was even delayed for a while until the torrential downpour lightened. A close examination of the jersey reveals several unique traits that beg for a photo match. I apologize for the jersey photos, as the details on the real item are much clearer. The pictures of Pete Catan wearing the jersey are screen shots taken from the original ABC broadcast of the game. Jumping into the examination, we'll focus on the back of the item. I have listed five distinct traits that work together to make the probability of a match 99.9%. Example A -- The left bottom of the nameplate was sewn onto the jersey at a noticeable angle that leaves the seam located below it. Example B -- The right bottom of the nameplate was also sewn onto the jersey at an angle that leaves the seam below it, but this angle is less than the one on the left side. The length of the right side gap is also longer than that on the left. Example C -- Seam has a small dark blemish just to the right of the second "7." Example D -- The second "7" is not parallel with the seam above it. The left side of the 7 is one inch away from the seam, while the right side of the 7 is only 3/4 of an inch from the seam. As a side note, the first "7" is parallel with the seam above, with a distance of one inch. Example E -- A hole has been repaired. A small breed of us weirdos actually consider this fun... But really, it boils down to having the resources, time and patience to do a bit of homework. You don't need formal forensics training to give photo matching a try, but paying attention to detail is always the key. Knowing the history of a used jersey in your collection will give you a great feeling, and your friends will be amazed when you show them the research you've done to pinpoint the unique story of your item. On a side note, the team repaired Catan's jersey by patching two holes. While it wasn't known at the time, the Gamblers would never sport their white jerseys again on the field. The final three games of their existence, played against Gunslingers, Invaders and Stallions (Playoffs), would be played using their home black jerseys.